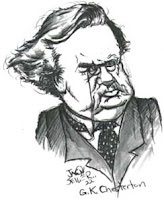 In the last few weeks I happened to quote a couple of thoughts of G.K. Chesterton, who is perhaps one of the most unjustly neglected writers of the 20th century—although his “common sense for the world’s uncommon nonsense” seems “more timely than ever here in the 21st century,” as the American Chesterton Society fairly puts it. In fact, it would be hard to deny that he was a prophet of the cultural disintegration of our times. “Vulgarity,” for instance, was the term he used to describe the abyss into which society was about to fall and the (ultimate?) result of “standardization at a lower standard.” Sounds familiar? Or the great march of mental destruction because of which “everything will be denied,” even that “leaves are green in summer” and “two and two make four” (ask Deconstructionalists, Postmodernists, etc. for further details about this and other brilliant “intellectual achievements”). But, as Hölderlin’s famous verse goes, “Where peril grows, there also grows what saves.” And that’s why I will keep on quoting G.K. Chesterton & perusing the American Chesterton Society website and its weblog. And I suggest you to do the same, for your own edification. Have a good read! Paul, it's evident that your comment refers to a previous post: this one ... and there is where I have just copied/pasted it.